Can our salvation be reduced to a single theory or is it a many splendoured mystery that defies an easy answer? 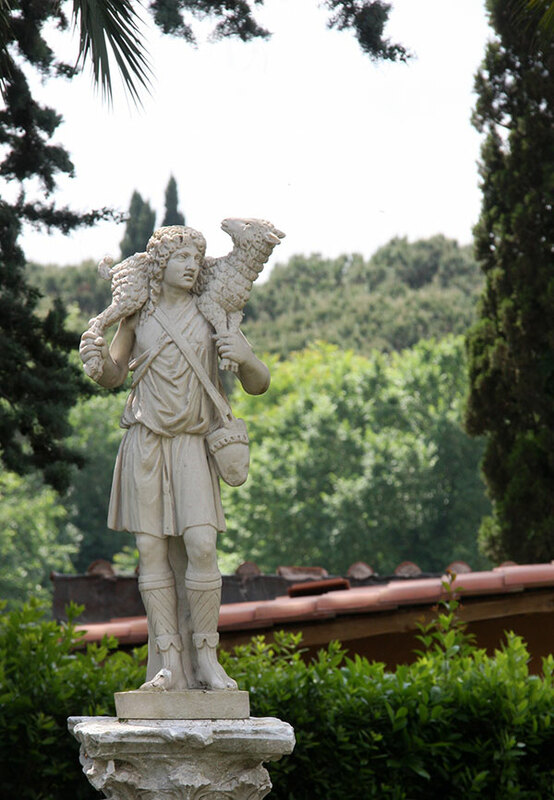 A statue of the Good Shepherd at the St. Callisto Catacombs, Rome. In the early centuries, Jesus was much more likely to be portrayed as the Good Shepherd than as a crucified Messiah. In the 1990s, when the Mennonite church in Ontario was deciding whether to add Hymnal: A Worship Book to its pews, a dear (now departed) saint approached me, saying, “I hear that they’ve taken out all the blood songs.” The person wondered if this important part of church heritage and theology was going to be left behind. Thinking for a moment, I assured my congregant that “blood songs” were about atonement, about God making right the relationship between humanity and God through Jesus, and that such theology would not be left out of the hymnal. Comforted, the person dropped the question. Weaver’s book, in its second edition, makes the argument that Satisfaction Atonement—see sidebar for definitions on page 6—cannot be defended from either a biblical perspective or from the effect it has had on women and minorities through the years. A quick survey of the gospels, the Book of Revelation, Paul, Hebrews and the Old Testament led Weaver to suggest that “a minimalist conclusion is that the survey [of Scripture] has demonstrated that Satisfaction Atonement is neither the only reading nor the required reading of the Bible.” He then interacts with feminist, womanist and black theologians, looking at the effect that the focus on Satisfaction Atonement has had. In particular, he believes that Satisfaction Atonement’s focus on Jesus’ passive acceptance of his suffering and death have led women and blacks to be encouraged to accept their suffering and to not respond to it in any way to try to change it. Weaver proposes a new Narrative Christus Victor, in which God does not trick Satan nor demand Jesus’ death. In his version, the powers of first-century Judaic religion and culture and the Roman government all conspire to kill Jesus as he exposes their inappropriate use of violence to keep control. Jesus responds with nonviolence, pushing and exposing the powers until they kill him. But Jesus, not-guilty of anything, is resurrected by God as a sign of God’s pleasure in Jesus’ life, teaching and obedience to the point of death. In Weaver’s theory, it is all of Jesus’ life on earth, and not only his death, which is effective in making right God’s relationship with humanity. In fact, for Weaver, Jesus’ death is not God’s direct will or desire, but the result of sin committed by the ruling powers of the day. Since Jesus is God, and since the Father and the Son are of one substance, and since Jesus preached and lived a completely nonviolent life, God cannot commit violence, he maintains. It is Jesus’ resurrection that seals God’s new relationship with humanity as God approves of Jesus’ obedience unto death, as well as his teaching and preaching of God’s nonviolent kingdom. Grimsrud has similar concerns. His idea is that retributive violence, based on the idea that sin or crime must be paid for by the suffering of the perpetrator, comes from Satisfaction Atonement’s monopolization of the American imagi-nation in terms of responses to criminal activity. If God demanded a payment in kind for humanity’s sin, how can society, and especially Christians, do less? But he believes the Bible has a different narrative. He sets out to show that the Bible supports a narrative of God being gracious and merciful, always offering forgiveness before humanity asks, obeys or offers sacrifice. Thus God frees the Hebrew slaves from Egypt before they arrive at Mount Sinai and receive the law. God gives the people of Israel a land before they have a full-blown religious system of sacrifice and worship. Grimsrud believes that God does not demand a violent response to sin and that God is nonviolent. As professor of theology and peace studies at Eastern Mennonite University, Harrisonburg, Va., he believes that retributive justice does not work and that humanity needs to apply God’s grace and mercy, extending these to people before they repent or know how to live differently. In his walk through the biblical narrative, he seems to ignore places where people see God as violent: the death of Pharaoh and his army, or of the residents of Canaan as the Israelites conquer it. Forerunners to Weaver and Grimsrud are writers like John Driver and C. Norman Kraus. In Understanding the Atonement for the Mission of the Church, Driver proposes 10 different biblical metaphors for the atonement. He believes that no one metaphor adequately covers what God is doing. Karl Koop, professor of history and theology at Canadian Mennonite University, Winnipeg, says there are “metaphors of atonement” that “don’t systematize the way contemporary theology does. The Bible for me is unclear. Salvation is complex, rich, large, a mystery.” In other words, God’s work of making things right between us and God through Jesus cannot be summed up in any one theory. Other writers and scholars, including Tom Yoder Neufeld, professor emeritus of New Testament at Conrad Grebel University College, Waterloo, Ont., in Killing Enmity, and fellow Grebel professors Derek Suderman, associate professor of religious studies and theological studies, and Jeremy Bergen, assistant professor of religious studies, echo this calling of God’s action on behalf of humanity through Jesus a mystery that no single human theory can contain. In the 1980s, Kraus found his thinking about atonement in Jesus Christ Our Lord raised many questions. His experience in Japan suggested that in a shame-oriented culture the idea that Jesus had died for someone doubly shamed the sinner, once for having sinned and again for having caused Jesus’ death. The Moral Influence metaphor, in which Jesus’ life and resurrection point to God’s love and acceptance, seemed to him to be better used. In discussion with Suderman and Bergen, they point out that in coming to Scripture for answers we can either come with assumptions, like the nonviolence of God, or we can come to see what it tells us about God and how God operates. They contend that, while Jesus taught nonviolence, this does not stop God from carrying out violence. An example of this is found in Abraham J. Heschel’s 1962 book, The Prophets, where God’s anger, exhibited in violence, is pictured as being the result of God’s love for humanity and God’s response to human injustice and unrighteousness. Epp-Tiessen agrees with Suderman, Bergen and Heschel. Coming to the atonement via the apocalyptic/end-times teaching of the New Testament, he sees both God and God-in-Christ at work to end injustice in the world, punishing wrongdoers and wrong-doing powers such as religion or the Roman Empire. Referring to Jesus as “the rider of the white horse” in Revelation 19:11, he says that the blood on the rider’s clothing is not that of the slain lamb, but that of the nations, echoing God treading out the winepress of judgment in Isaiah 63. The Bible seems to tell a story about human and divine violence. In the first few chapters of Genesis, both God and humanity were violent: God sent the first man and woman out of the garden, where one of their sons killed another in jealousy. In Genesis 4, Lamech exulted in having killed a young man for hitting him. Violence at this point took the form of vendettas and revenge, something that God later limited in the lex talionis of Exodus, from which the phrase, “an eye for an eye,” comes. In the Book of Joshua, the Israelites were only to go to war when “the commander of the Lord’s army,” God or an angelic commander, sends them to war. In II Samuel 24 and I Chronicles 21, David was censured by God for taking a count of his fighting men, instead of depending on God for security. Over and over again, God raised up judges/leaders to fight against invaders, and sent David to war, all the while taking more and more control of human violence. And then Jesus taught love of neighbour and enemy. In the apocalyptic violence of New Testament times, more and more it is God who set things right, no longer using human intermediaries. God-following humans, trusting in God’s righteousness and justice, but not seeing these in human lifetimes, trusted that in some future time God would bring about righteousness and justice when the unrepentant evildoers would be punished and the righteous would be rewarded. God retains the right to violence and God-following humans hope that God would not abandon the weak and downtrodden to the wiles of the wicked. But the idea of sacrifice and satisfaction need other metaphors to be whole. Epp-Tiessen, Suderman and Bergen all point to the lack of discipleship teaching which often arises from the “once for all” being made right with God. Other metaphors—such as the Moral Influence theory, in which Jesus teaches us with his life, ministry, death and resurrection how God wants us to live, and Weaver’s Narrative Christus Victor, in which living lives of righteousness and justice put us in alignment with God’s kingdom, making us right with God—strengthen the response to God’s action by human recipients. That said, it is important for us to look at the effects our theology has. Weaver and Grimsrud both point to uses of Satisfaction Atonement that have and continue to oppress people in the name of following God’s example. Other questions remain. As one of many metaphors for God making things right between God and humanity, did God require a death for justice to be done? Or did humanity think that God required such a death, and God, in love and mercy, provided such a death to convince humanity of God’s love and mercy? In theology, the questions are never finally answered. Suderman and Bergen wonder if people in the pew can live with the ambiguity of multiple theories and no final answers. Dave Rogalsky is the Eastern Canada correspondent for Canadian Mennonite and pastor of Wilmot Mennonite Church, New Hamburg, Ont. 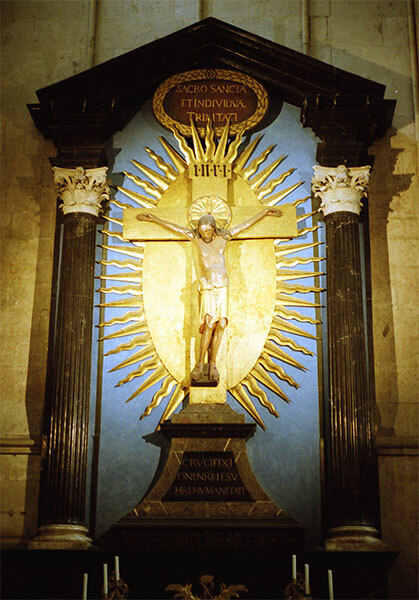 The Gero Crucifix in the Kölner Dom (Cologne Cathedral, Germany). In the Middle Ages, Jesus’ suffering on the cross came to the fore, shadowing other images of Jesus as Saviour. 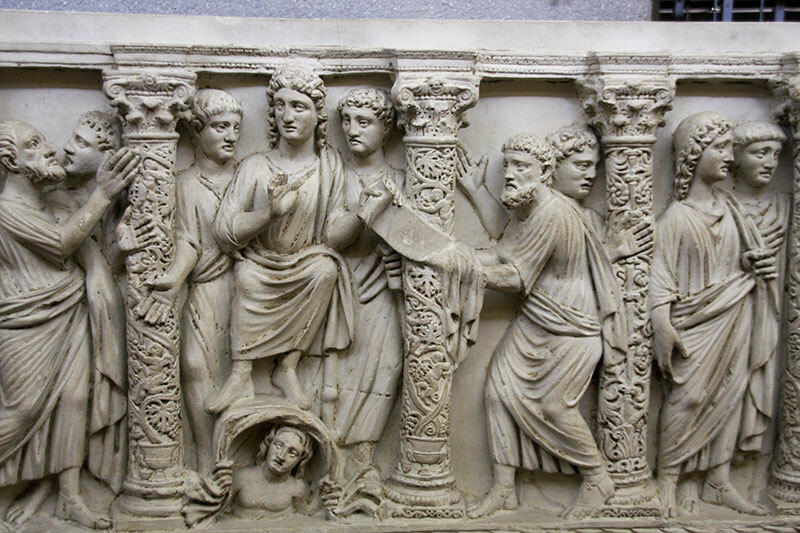 Jesus is pictured on the side of this early Christian sarcophagus in the Vatican Museum turning his back on Moses and the old law, and giving the new law of love to Peter. 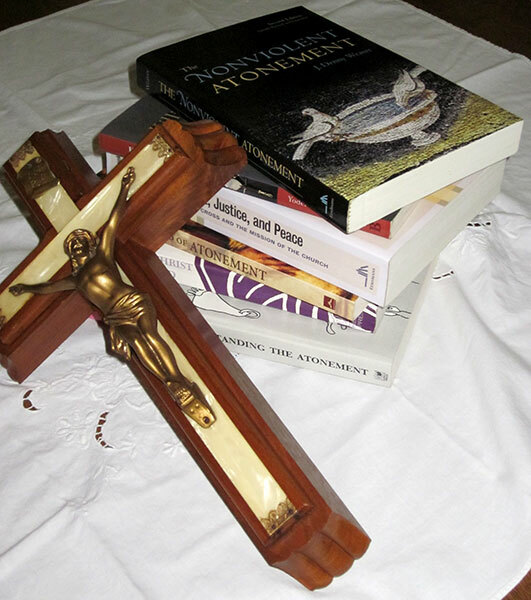 How Christ actually provides for our salvation is the theme of many Mennonite books.